Maryland Old Senate Chamber Restoration - Week 2 | John Canning & Co. 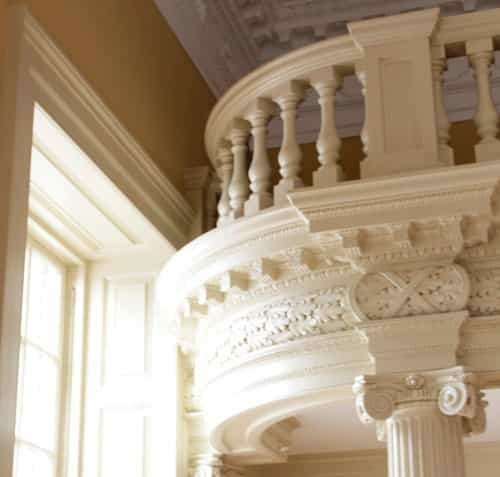 In our previous post, we discussed the ornamental and flat plaster process of the Maryland Old Senate Chamber restoration. 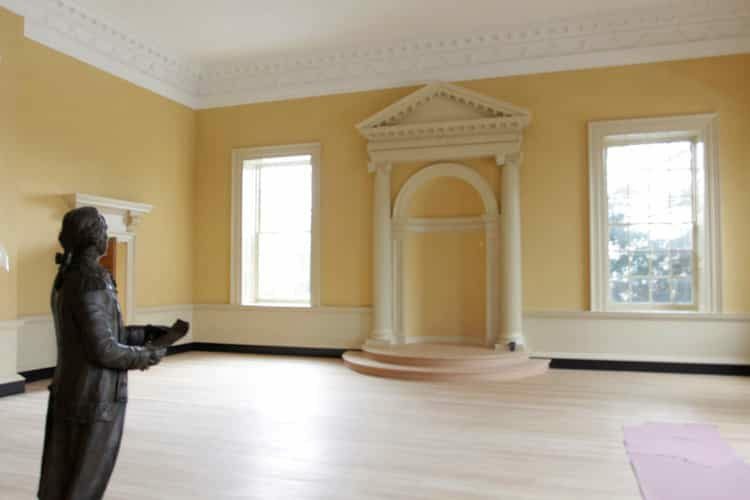 As each plaster element was applied, fabricated, and installed, the Chamber appeared more and more as George Washington would have seen in during his resignation speech. The final elements in restoring the room were the painted finishes. True and faithful to the restoration process, traditional soft distemper paint was used. Distemper paint is the ideal paint for traditional lime plaster. It dries to a very desirable soft matte finish and, since it is high in permeability, allows the plaster to breath and thoroughly cure. It is important to note that soft distemper paint is water soluble and can easily be damaged with water. Soft distemper paint consists of five ingredients: pigment, binder, preservative, hardener and retarder. For the ceiling, powdered whiting was used as the pigment and rabbit skin glue as the binder. Preparing the paint is a two day process, consisting of soaking each element in water before thoroughly hand mixing them together, the distemper resembles a whipped jelly that is easily brushable. 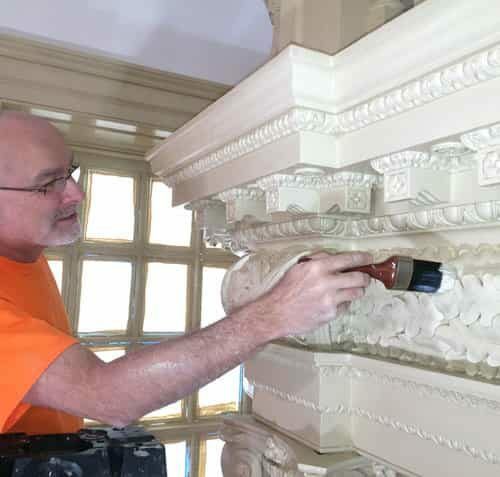 Using traditional pure bristle distemper brushes several decorative painters had to work in unison, constantly maintaining a continuous wet edge. 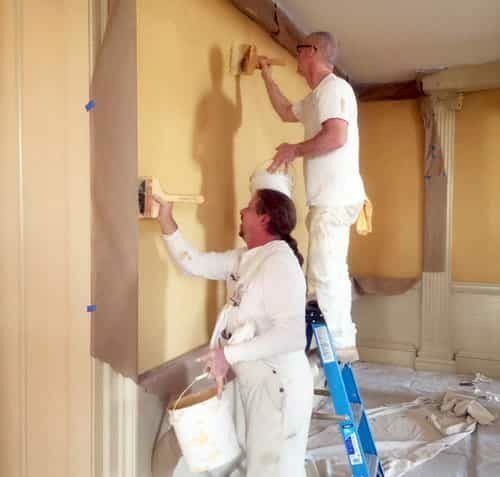 For the walls, dry pigments of raw sienna and yellow ochre were soaked over night to create the original yellow color. Finally, an old fashioned linseed oil paint was applied. Dry pigments of white and raw umber were ground in oil and thinned with turpentine, driers and a small amount of varnish. Traditional brushes were also used for the application of the linseed oil. Our efforts proved to be successful as the original finishes in the room were restored. Everyone involved with the project worked together to have a fully restored and successful project from the ceilings to the dowel assembled wooden floors. Click here to read more about what Gov. Larry Hogan thought about the project.